Winter Park was founded in the 1880s as a balmy paradise for rich Northerners seeking to escape the tribulations of harsh winters or improve their health. The wealth involved in its foundation is still evident in the city's beautiful buildings, a planned African American neighborhood, and a preeminent liberal arts college. The community revolves around a series of picturesque lakes, offering visitors and residents alike many recreational opportunities. The large hotels, in conjunction with Park Avenue's shops, museums, and restaurants, provide many amenities in a lovely setting for visitors both past and present. Among the city's most notable attractions are the Morse Museum of American Art, founded in 1942, which houses the world's largest collection of Louis Comfort Tiffany's works and Rollins College, founded in 1885, which has become a vital part of the community, attracting vibrant personalities both as faculty members and students. One of its most famous alumni was Fred Rogers of Mr. Rogers' Neighborhood. Jim Norris and Claire Strom are professors of history at Rollins College, where Danielle Johnson and Sydney Marshall are students. The archive at Rollins College supplied most of the photographs for this collection. 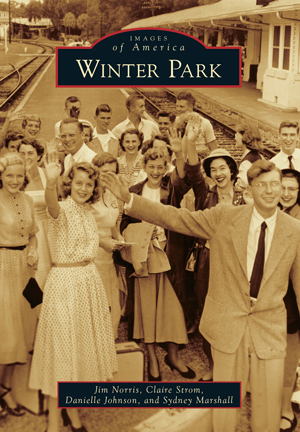 Other imagery was provided by the Winter Park Public Library and the Winter Park Historical Society.